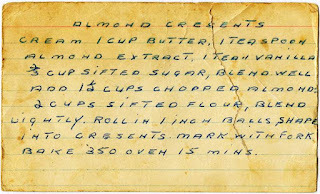 Here's another cookie recipe out of my grandmother's box of goodies. This Almond Crescent recipe is very simple, with only a few main ingredients (butter, flour, sugar) and takes maybe 10 minutes to whip up the dough, and 15 minutes baking time. 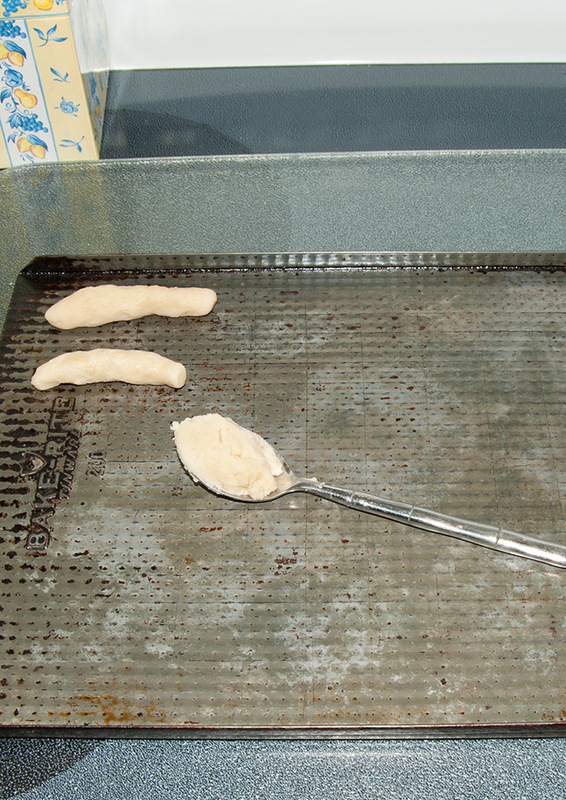 The most time consuming part of it is forming the crescents before baking, and then carefully dipping them into a bowl full of sugar almost as soon as you get them out of the oven. You can see by the recipe card (her original one - click here to download it.) that Nanny wasn't big on instructions, but they are pretty simple. Cream the butter until it's whipped up fluffy and light. Add the almond and vanilla extracts, and beat well. 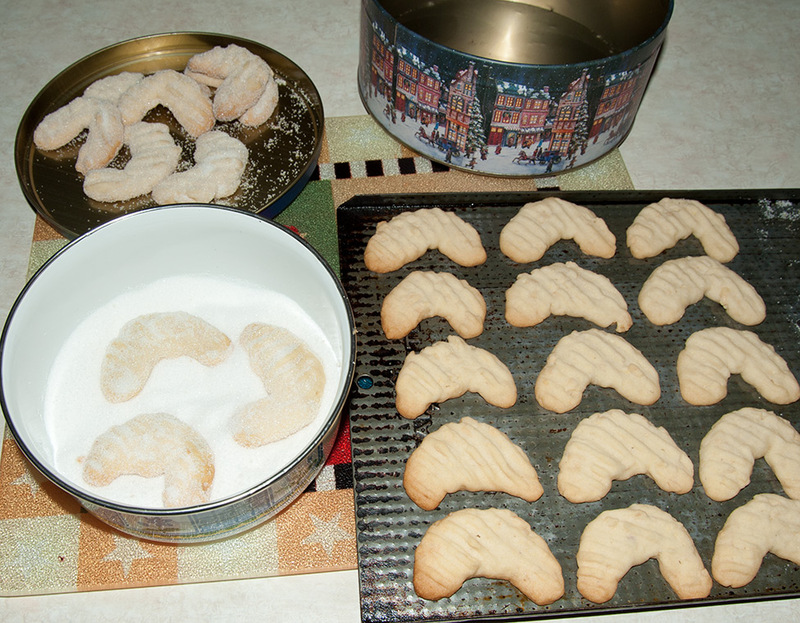 While continuing to beat, slowly add the sugar and keep beating until nice and smooth. Mix the chopped almonds with the flour, and gradually add to the whipped butter, mixing with a large wooden spoon. 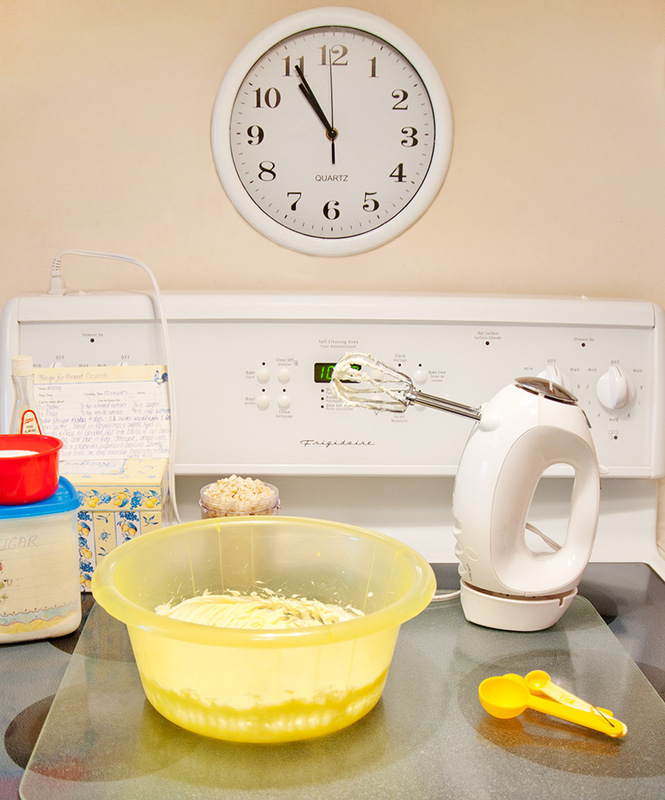 The single recipe makes about 2-3 dozen cookies, depending on how big you make them. I almost never make a single batch of these, and usually make two double batches for the holiday season. Shape spoonfuls of dough into little logs (her recipe says "balls" but little logs are easier) and place on a non-stick cookie tray. My cookie tray is not a non-stick one, but it is many years old and has become so seasoned that I don't often have to grease it for any reason. Curve the little logs into a loose crescent shape, flatten with a fork and bake at 350 degrees for 15 minutes. Remove from the oven, let cool for no more than 5 minutes or so, and dip into a bowl full of sugar one or two at a time, making sure to coat each warm cookie fully (front and back). You must do this carefully since the cookies can be a little fragile while they are warm. Store in cookie tins until using. These can be stored in the freezer for a few weeks, so they are a good "make ahead" cookie. This is another of her cookies that we typically only saw around Christmas time because ... well, that was traditionally when she made them, from even before she came to Canada. I assume part of the reason for that in the early years was the fact that this does require butter (you can't really use a substitute here), and butter was either very expensive or rationed and hard to get for extras like baking treats (sugar too). During the 1940s, my grandfather went back to Scotland to find his brother's body (he was a twin, and his brother was a casualty in the war) and give him a proper burial. While he was in Scotland, transportation was halted, and granddad couldn't get back to Canada for several years, leaving my grandmother to raise their kids alone (4 girls and 1 boy), with no income in Canada. So, most types of cookies that needed butter and sugar weren't made except for the most special occasion of the year - Christmas. As long as I can remember, almost everyone in our family has expected these cookies at Christmas, and might raise an eyebrow or two in shock if they were to have appeared at any other time during the year. 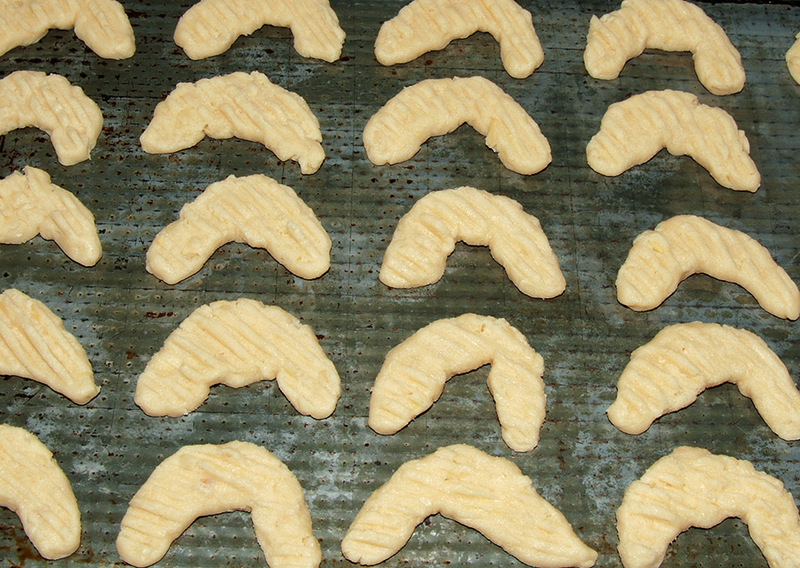 Like a lot of her recipes, these cookies had their time and place. I usually only make them at Christmas too. 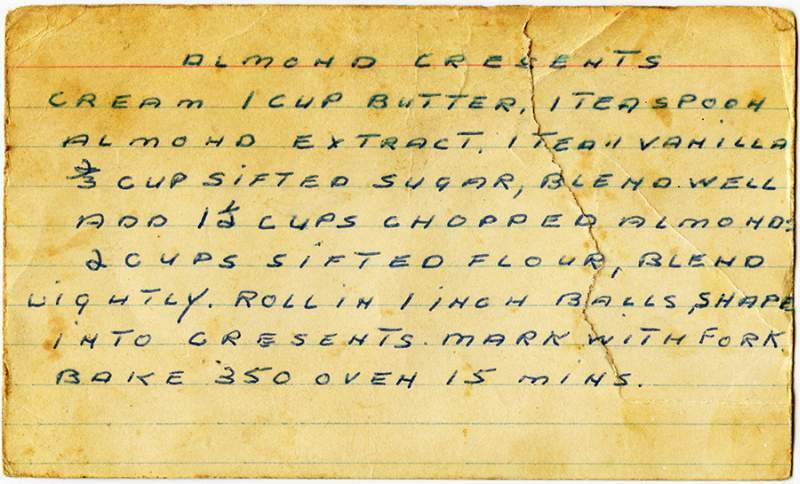 There are several places on the internet where you can find recipes for Almond Crescents, but none that I've looked at are the same as this one. 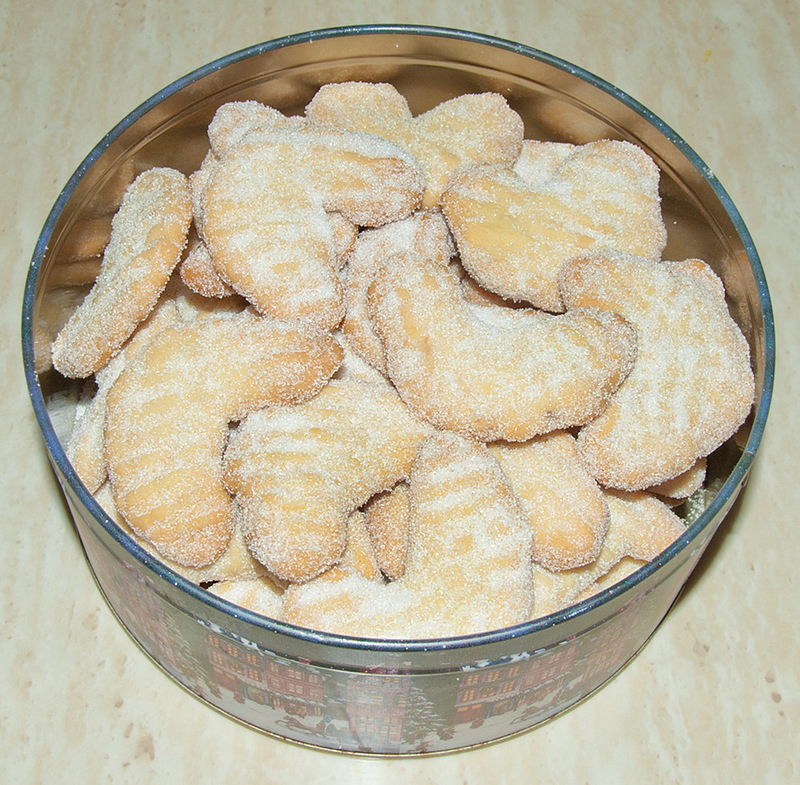 Most call for powdered sugar (we have always used regular granulated sugar), and some even are labelled "shortbread cookie", but they aren't. I think that this version isn't a cookie that is made very often. During the years I participated in "Cookie Exchanges", and handed out gift cookie tins, no one else had even heard of these cookies, let alone baked them. When you're raised with something like this, it's a bit of a surprise to find out nobody has ever had them. One of my sons-in-law has loved this cookie since the first time I made them. I usually try to make him a separate box at Christmas when I do the family cookie boxes ... just so he gets his fill! And I just have to say it ... these are delish!